Started in 1987, Locomotion has become a favorite party and dance band in southern New England performing all styles of music at weddings, clubs, fundraisers, anniversary celebrations, retirement dinners, surprise parties, corporate functions, holiday parties, New Year's Eve celebrations, class reunions, summer concerts, and town fairs and festivals. For 30 years, Locomotion has played countless events across all of Connecticut, with numerous shows in Massachusetts, Rhode Island, and New York. 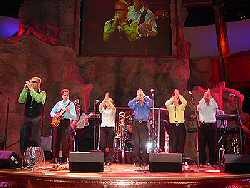 The Locomotion lineup consists of a full power-house horn section, two lead singers (guy and gal), and super tight rhythm section to deliver a wide range of music including classic Motown hits, funk, rock, 80's dance, disco, standards, swing, and rhythm and blues. Its many years of professional experience and musicianship gives the band the ability to perform authentic renditions that sound like original recordings. Show after show, Locomotion packs a punch to bring you a high-energy, interactive, crowd-pleasing and classy experience you and your guests will love and remember long after your event is over! 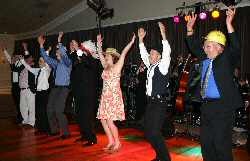 Nothing beats the the vibe and energy of live music for your special event! Locomotion offers you the best in live music entertainment for your party, meeting, gathering, or any public or private event. In fact, Connecticut Magazine named Locomotion Best Band in Connecticut in 2003! Explore our site and learn more about the band. Then, get in touch with us! If you are ready to book Locomotion for your wedding, club, fund raiser, corporate party, fair, festival, or other event, the first easy step to get things rolling is to fill in this simple form. The first thing you need to know is if we are available for your date. We'll get back to you in a heartbeat and see how we can pull together to make your event the best it can be! Or, contact us here to tell us about your event so we can discuss how we can help make it one to remember! Either way, it's free, it's easy, and there's no obligation. Thank you for visiting and considering Locomotion!